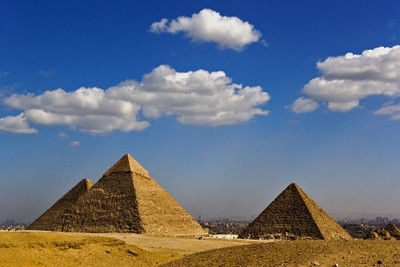 Day tours to Cairo from Port Said Port, enjoy excursions to the Pyramids of Cheops, Chephren and Mykerinus, the Egyptian Museum, from Cruise ships arriving Port Said Egypt. Egypt Travel Representative will pick you up from Port Said Port by the cruise exit door, holding a sign of your name. After that you will be transferred by an air-conditioned vehicle to Cairo, approximately 3 hours, joining a police convoy till reaching cairo. First pay a visit to the Pyramids of Cheops, Chephren and Mykerinus. Then proceed to visit the Great Sphinx, the head of a pharaoh with a lion's body, which dates back to the time of Chephren; the tour also includes a visit to the Valley Temple, which belongs to the Pyramid of Chephren. Lunch at local restaurant, then move to the famous Egyptian Museum, housing the largest collection of Egyptian artifacts in the world, including the magnificent treasures of King Tutankhamen. Then, a short time will be spent at an oriental shop where a demonstration will take place introducing you to the art of paper making from reeds, discovered by the Ancient Egyptians. Limited time for souvenir shopping will be allowed before you return to the Port.